Product Details: Very Easy to Use. Fill the Cup with Coffee, Place It in the Keurig Machine and You End up with a Hot K-Cup of Coffee to Sip. 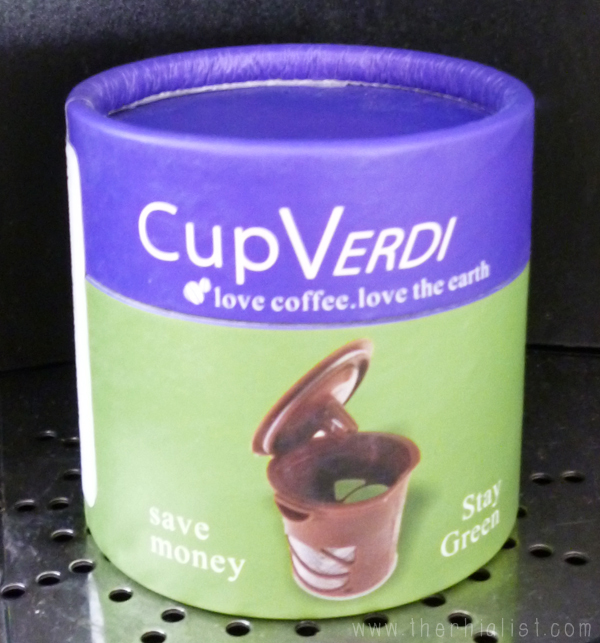 - The Cup Verdi is extremely easy to clean. The smooth inner surface is called the pod which is quite easy to clean. 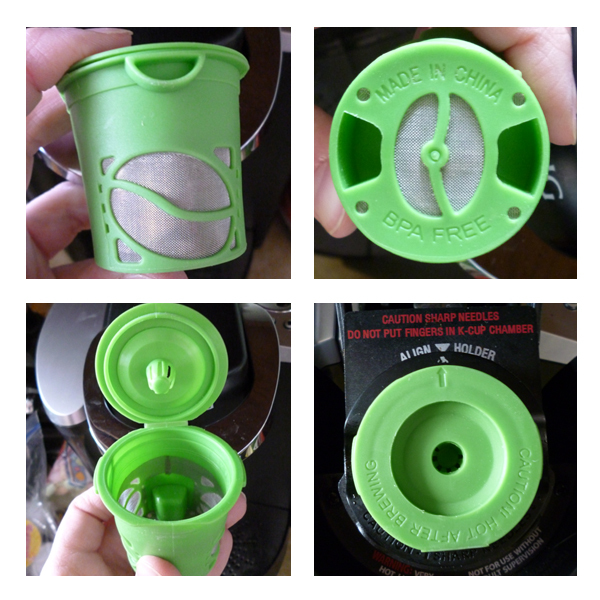 - The Keurig reusable K-Cup can be used for various kinds of coffee. People can keep numerous coffee grounds and make coffee in this durable K-cup. - The price is extremely cheap. $5.99 is reasonable for such a brilliant idea. - The K-cup reusable coffee filter is economical and eco-friendly. I love my Keurig but I hate the waste that comes with K-cups so I rarely buy them. 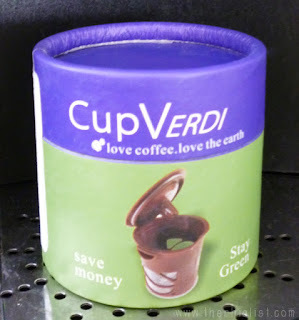 Instead I've used reusable cups like the Verde since the day I got it. Unfortunately, not all reusable cups are worth using. The Keurig branded one is horrible and expensive to boot, I wouldn't recommend it ever. But I have found a couple that I do like and the Verde is one of them. It's inexpensive, easy to fill and clean, and holds up well to frequent use. My husband didn't care for the Verde. He said they used one in the machine at his place of work and had a lot of issues with grounds getting into cups but my experience at home was just the opposite, I found less grounds and silt in the bottom of my mugs over any other reusable filter I've tried. Sadly, our dog decided to get up on the counter and chew mine up so I'll be ordering another one. It's just all around a great choice! 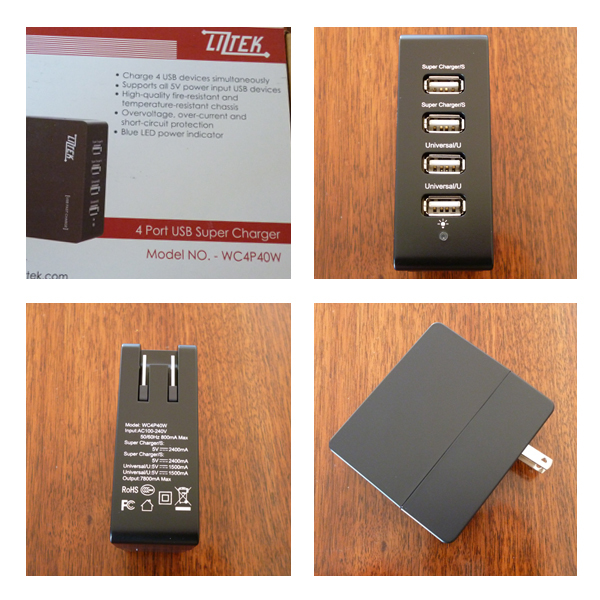 Product Details: Liztek WC4P40W 4-Port USB Wall Charger with SmartLiz Technology reliably charges up to four devices at the same time, is compatible with most devices from Apple, Samsung, HTC, LG, Motorola, Nokia, Sony, etc., an ideal travel wall charger, plus is compliant with USB Battery Charging Specifications 1.2 (BC 1.2). Features two universal 5V1.5Amp ports plus 2 Super Charger ports offering high speed charging power up to 5V2.4Amps per port. SmartLiz USB Charging Port Controller will detect the attached devices and self-adjusts to avoid any compatibility issue and offer reliable power for any high power required iPad, tablets or phones at maximum power. Built-in surge protector and over-charge protection. I love gadgets and tech toys so my bedside is a mess of cords that are constantly being rotated. So I finally got smart and decided to pick up one of these 4 port wall chargers to cut down on some of the clutter and I'm so happy I did. It doesn't get crazy hot and the prongs fold down making it very portable for users who need something like this for travel. The charging is speedy enough I don't notice a difference between it and the regular chargers. The only thing I dislike about it is how bright the indicator light is. I found that for bedside use it was very bright and bothered me but a small sticker (that's what I put on mine) or piece of black electric tape can fix that if it's an issue for you too. Put some grown-up art on your walls with Minted. We've owned our house for 5 and a half years and we have nothing on our walls. I have a list of excuses a million miles long from the simple—we wanted to repaint all of the walls—to the frustrating—the hubs and I don't have the same taste in art—and a dozen things in between. If I had it my way I'd have some kind of fanart in every room of the house. I'm a geek. I embrace my dorkside. Mr. Rhi used to be of the same mind but he's outgrown it and wants 'real art' on the walls and he wants it yesterday. So I'm working on it. One of the only thing we can generally agree on is a color scheme. In our living room and bedroom we favor grays and neutrals overall. Since the kitchen is my domain I get free reign of color choices in there but it already has dark oak cabinets with lime green counters and dark brown linoleum. The bathrooms are both in need of an overhaul because my frog theme has grown tired over the past 10 years I've had it and I'd like the master bath to feel a little more grown up than the family one. 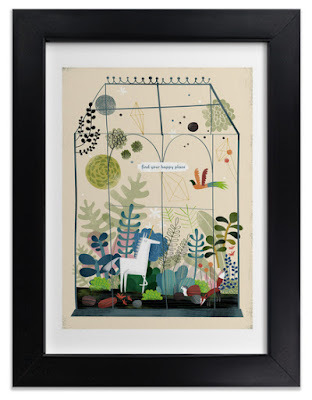 This past week my attention was drawn to Minted, where they've added an expansive collection of lovely art prints and gifts. Previously, I had only known of them as an elegant personalized stationary brand so it was a very wonderful surprise to discover they had prints I'd like for each room I'm looking to put art up in. Because our bedroom colors are black and gray I've struggled to choose something for our bedroom. Part of me wanted to add a splash of color such as a rich scarlet or amethyst but I found both too aggressive for a room we sleep in. 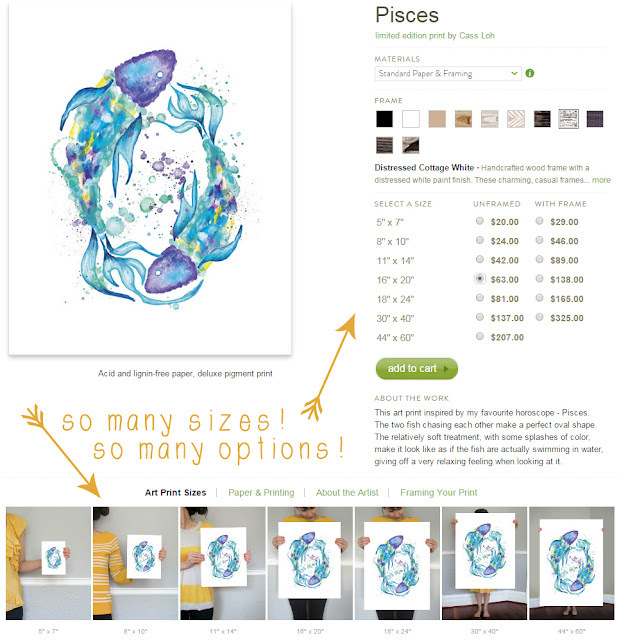 But as soon as I saw these Horoscope prints I knew I had to have them! Not only are they soft in hue and available in a frame that would look wonderful in our bedroom, the gold metallic foil of our respective astrological signs—his being Pisces, mine being Scorpio—are an elegant but subtle color pop. Can you imagine these hanging over our respective sides of the bed? Could I have found anything more suitable? As I thought about choosing something for my kitchen things got a bit more complicated. I have such difficult colors to attempt to coordinate with anything I choose. I'm also notorious for preferring things that one might consider eclectic or whimsical. My kitchen and dining area are also very tiny and I don't have a lot of space so there are really only two spots I could put something. As I pondered and perused I considered items that reflected baking or eating but none of them felt right. Maybe I should go with something plant related since my lime counters would look great with other greens? Nah. 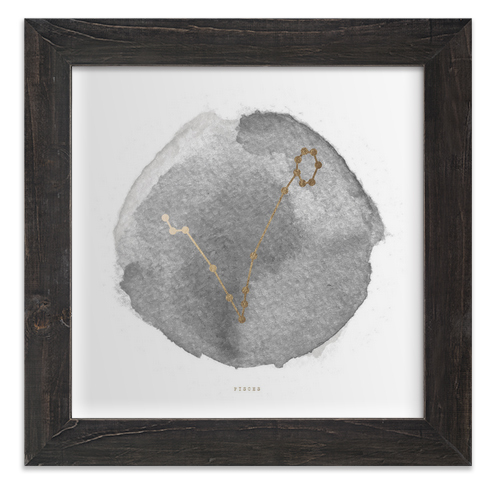 One of the coolest things I discovered on Minted is that some of their prints are available in more than one color palette. 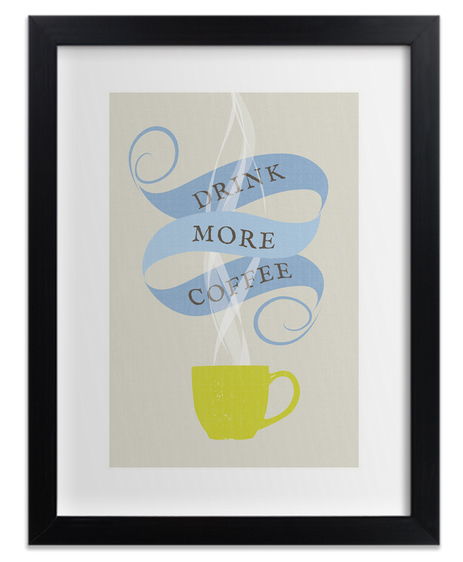 I ultimately decided that I would go with a print aptly called Drink More Coffee—which is perfect for me if you were to ask my friends. It comes in Lime which would look wonderful with my counters but also is available in Blueberry or Tangerine. It has a playfulness that speaks to me and yet feels grown-up so Mr. Rhi would like it too. The biggest challenge of the house though is our living room. We've been planning to redo our fireplace since before we signed the papers to purchase the house. Let's just say the late 70's called and it wants its ugly tiles back. But once we do finish that we know for sure we want something that's eye-catching while not being an eyesore to place above it. When we put in new windows last summer I found a set of curtains I love in a charcoal and white tree limbs kind of motif. We love those curtains so it's essential that we keep our art choices in the room in the same nature-centric feel. Although I found some really lovely prints that carried over the tree motif, we already have several live plants in the room so I didn't want to go with anything of that ilk. Both of us are very fond of birds, he's a falconer and together we've raised pigeons so I thought something with feathers might be a nice choice. 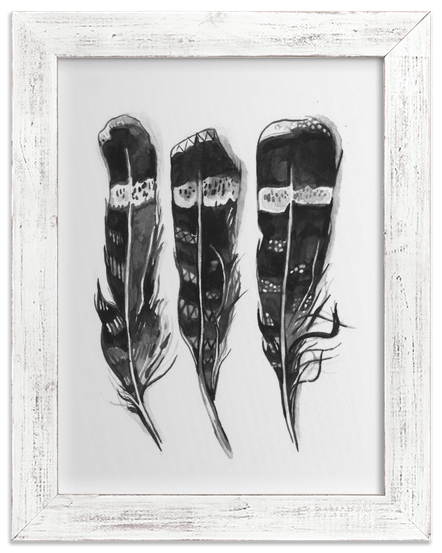 I found a print called Hawk Feathers that I like a lot. It's simple enough I could tilt it on the mantle and surround it with branches or shells or stones to pull it together. I'm not sure it's to Mr. Rhi's tastes though. Next, I looked into the Maps and Landmarks section in hopes of finding something featuring our state of residence, Montana. It's often passed over in favor of other states so I didn't get my hopes up at all. 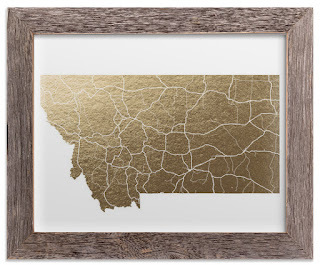 Imagine how thrilled I was to find this stunning foil Montana map complete with county lines! Wouldn't this make a cool grad gift for a student moving away from home? I played around with the framing options a bunch and decided that it could only be put into the Reclaimed Barn Wood because it's Montana. Alas, the largest it comes in is 11"x14" which is too tiny for what we'd like. 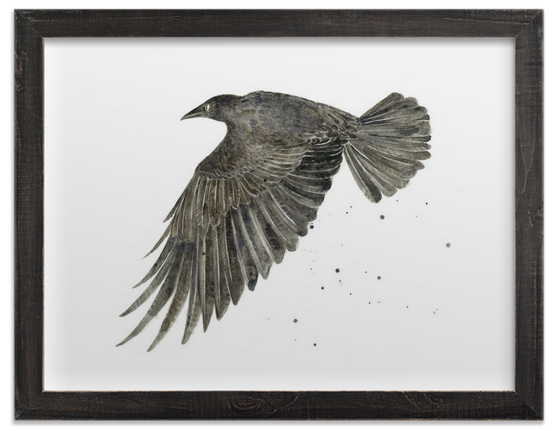 Back to the hunt I by chance stumbled upon a print called Ink Raven that I knew immediately was THE ONE. 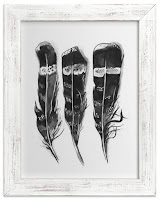 I've had a thing for ravens since I was a little girl and the simplicity partnered with the rustic feel of the water colors just works for the feel we'd like in the living room. Because isn't that what the most important part of finding a piece of art? That it speaks to you on a personal level. I think so. Since I haven't decided which theme I want for each of our bathrooms yet—I'm leaning toward a steampunk mermaid thing for the master bath but that's so custom I'm not ready to commit—I decided not to shop for them just yet. With that in mind the final piece I was looking for was one to put in the awkward hallway/office space I occupy for about half the day. I currently have a very cluttered cork board filled with trinkets and mementos that I'd like to get rid of because it's a dust collector and looks more cluttered than cute. For my office space I'm all about something that is pure fun. The unicorn was what initially caught my eye in Find Your Happy Place. My inner 5-year-old did a squee. What sold me on it though was how it blended the feel of a terrarium with the charming message. Having been going through some tough stuff in my personal life recently that kind of affirmation to look at when I'm having a bad day makes it a perfect office space decoration. I found many prints that I loved but that didn't suit any of my spaces that I decided to share them with you just in case you're looking for inspiration. Which are your favorites? With hundreds of beautiful prints and framing options you're sure to find something to suit your space or that will make a personal, heartfelt gift for someone special. Not in love with the frame options? You can buy them unframed in many sizes and take them to a specialty shop instead. Or just go wild and create your own gallery wall with a mix of your favorites. When it comes to art and decor I think only YOU can decide your own rules. Do you consider your tastes more traditional or modern? Prefer drawings or photographs? Would you rather wake up to bold geometrics or delicate watercolors? Minted has them all and more! Which of my picks do you think I should buy first? Leave me a comment and tell me which you like or visit Minted and tell me which ones you would buy for your home. Disclaimer: This is a sponsored post. I am receiving site credit in exchange for this feature. 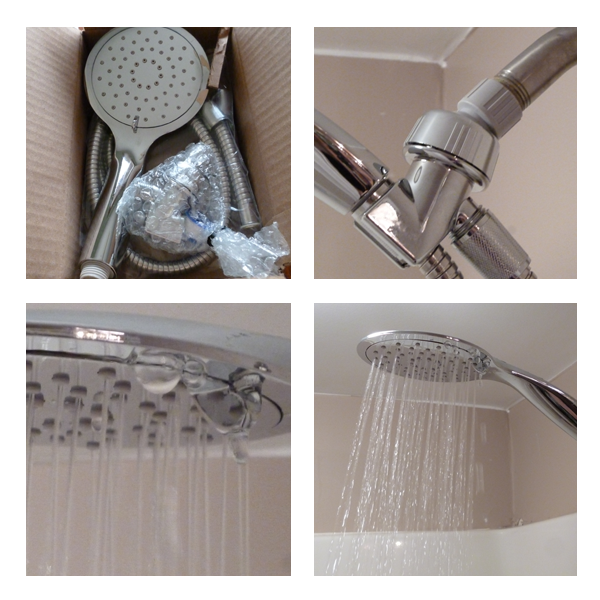 The hubs and I have wanted to switch our master bathroom's showerhead to a hand shower pretty much since we purchased our house but it's one of those things we never got around to. 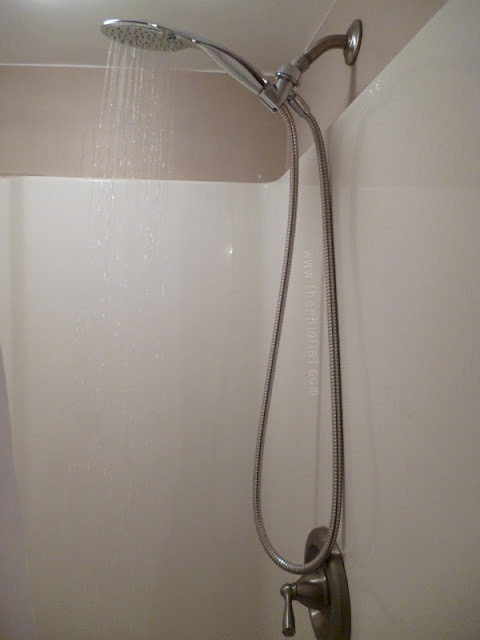 The Razor from Aquagenix seemed like a really nice option for the tiny stall shower we got stuck with. The hose itself is nice but I'll admit that the rest of it does leave a bit to be desired. First of all, it was very easy to install. Definitely follow the instructions to the letter, I wasn't sure how tight was too tight and I'm not very handy so I had to loosen it and fix the rubber ring. Once installed it's attractive and generous in hose length but I found that I don't care for the switch from the rainfall setting to the harder setting. Something about it causes a lot of leakage around the edge. It's also VERY loud which my husband commented on first and he's the one who doesn't mind that kind of thing usually. It seems to be somewhat flimsy, as it's plastic, so I don't know if it's going to hold up over time but in the month I've had it I've decided I will probably keep looking because it's just way too loud. That said, if the noise factor is a non-issue this is generous in hose size, provides a nice water flow, and is very easy to install. 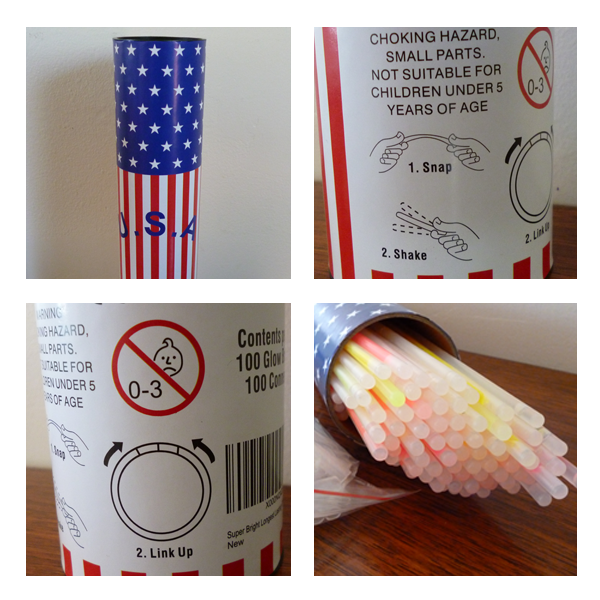 Product Details: The best brand of glow sticks on the market. You will receive 1 tube of 100 luminescent light glow sticks. They can be made into bracelets, glasses and so much more. Each tube contains of 5 colors -- Blue, Green, Yellow, Orange, and Pink. Your order will also contain 100 connectors so you can hook the ends together to make bracelets and necklaces. Once they start glowing, The Super Glow brand glow bracelets will last all night. They will glow super bright for 8 - 10 hours. Then, they will start to fade out but may continue to emit some light for up to 36 hours. These glow bracelets are fresh from the factory. Keep them in the freezer to make them last longer! Glow sticks are pretty much THE party essential in our household. They pop up on special occasions and quite often in just everyday ones too. 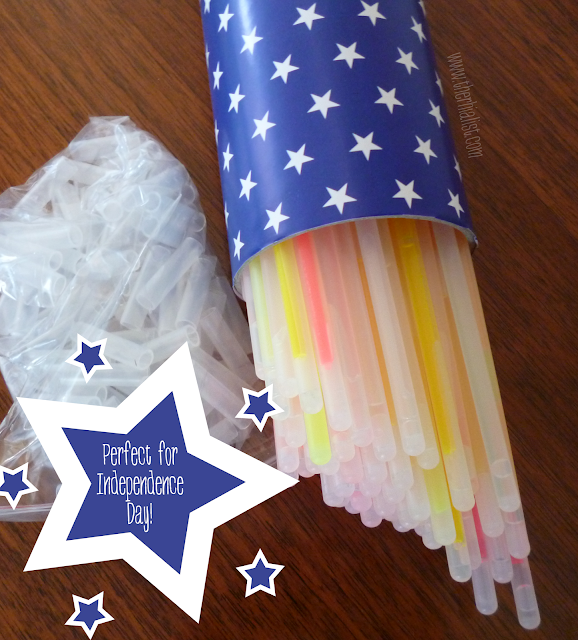 They're an inexpensive and fun treat for kids and can be loads of fun for adults too. This particular tube of them totally rocked. I counted to make sure it was a full 100 and it was. The overall quality was great although we had a couple of duds in the tube that we couldn't get to glow for some reason. They're awesome for all the typical bracelet uses but one of my favorites is one it's been too cold this year for yet... putting them in the kiddie pool as a fun evening treat! 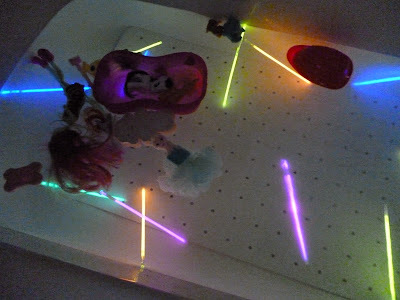 So I put some in the bathtub for my 5-year-old and she had a total blast with her 'glow bath'. (Obviously this is an adult supervision only activity). You could do the same with buckets/bowls of ice and water to stick bottles and cans in at outdoor summer parties. I've tried lots of different brands and this one was the best one I've come across in terms of price and bright glow that lasts. I would definitely recommend it! While I liked the sort of hippie-ish personality of Stiles and found the approach very friendly and mindful-ness centered I just couldn't bring myself to think this book set out to do what its title implies. The focus on meditation and yoga are wonderful, if frequently repetitive. The recipes and food, however, seemed lacking in terms of long-term health. If you're looking for recipes I don't think any of them are bad, but I would not encourage anyone to follow the 30-day transformation without first consulting a nutritionist and/or physician. I'm no makeup artist but I am a bit of a makeup brushes junkie. I love trying new ones and have amassed a pretty large collection from many different brands and levels of quality. This Xtava set seemed like a fabulous starter set so I couldn't resist reviewing it. 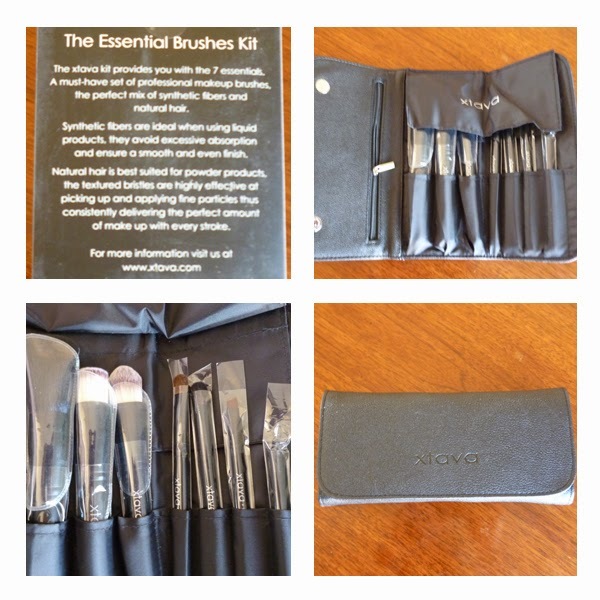 The 7 brushes included are wonderful basics and come in a terrific wallet style case. While I personally won't use the case those who do their makeup on the go will love it. Overall, the one brush I didn't care for is the kabuki brush. I find it a bit too stiff. But every single one of the others is great for being such a budget friendly set. I did find the Eye Shadow Base brush sheds a bit which I wasn't thrilled about but after a few washes I'm not noticing it anymore. My hands down favorite from the entire set though is the lip brush. I've never been a big fan of them before and now I use it all the time. If you're in the market for a cost-conscious set of starter brushes I don't think you can go wrong with this set. If you're a MUA or just very experienced you might find these are indeed not quite as nice as designer brand brushes but they might make a good backup set. Have you tried this makeup tool yet? 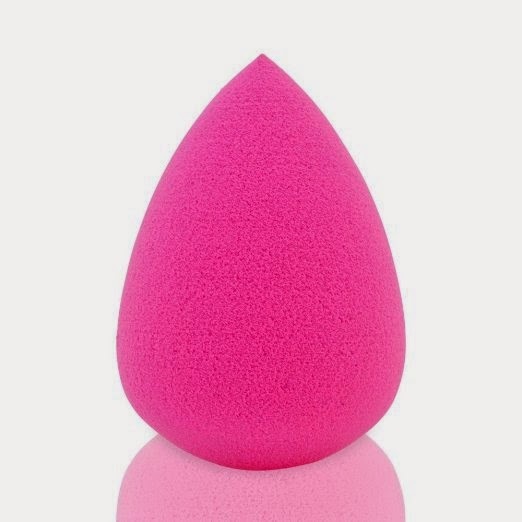 Product Details: Apply foundation flawlessly with a soft makeup sponge that will leave a smooth, even application. With its teardrop shape, sponge is easy to hold while providing both small and wide surface coverage. Eliminate streaks and allow even distribution of liquid and powder foundation every time. Let me preface this review by saying that this is the first time I've used this type of product. After seeing these blending sponges hyped quite a bit I figured I'd give it a try but I just didn't find it that much different from using my fingers. It soaks up so much of the foundation I found it hard to get much to stay on my face. This could be due to the ingredients in the foundation I used, I'm just not sure. I suppose if you prefer a sponge blender this is an inexpensive option you might like. I found that I'd just prefer washing my hands and using them rather than having a sponge to clean and get dry between uses. The results were similar enough I just don't see the need to own one. Pastries – Breakfast Sausage Danish; Traditional Croissants, and more. Now, you're never too busy to bake bread! Yeast bread isn't complicated to make, but because it needs time to rise, it’s not always easy to fit it into time available - that’s until now. 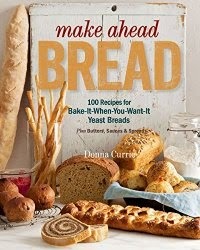 Make Ahead Breadgives inexperienced bakers and busy home cooks the information you need to make flavorful, freshly baked bread on a schedule that works for you. If there's one thing I've been missing since my spouse was diagnosed with a bunch of food allergies it's breads. I had picked up a copy of this book last fall in hopes of tackling homemade bread in the new year and sure enough my husband is allergic to wheat, yeast, corn, and a bunch of other basic ingredients found in almost every recipe in this wonderful book. So it's become a bit of a comfort book for me. 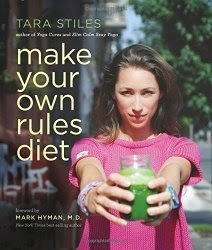 Instead of baking the recipes here I page through it and fantasize about the recipes instead. Because most of them look like even I could tackle them! Maybe once we get a handle on his allergies I can try some of them but for now we're trying to keep the foods out of our home as much as we can. I love that these are the kind of recipes you can divide the work on. As a busy mom and blogger I just do not have time to spend all day in the kitchen kneading and prepping. If you're in much the same boat I do recommend picking up a copy. Comics superstars Mark Millar and Frank Quitely reinvent the superhero epic for the 21st Century! 1932: Sheldon Sampson's dreams about a mysterious source of power lead him, his brother Walter, and a group of loyal followers on a quest around the world. What they discover sets them on a course that will wrench a family apart and alter the world's political stage! Decades after their journey, Sheldon and Walter are superpowered legends, world renowned for their heroism. But the offspring trained to live in their image have fallen desperately short. Rocked by one public scandal after another, Chloe and her brother Brandon are a dishonor to the generation before them. The rift reaches its breaking point when one branch of the family overthrows the government and struggles to rule at any cost - while the others must flee for their own safety. But when the failures of the corrupt leaders catch up to them, the world hovers on the brink of collapse - and the hidden heroes must emerge to take back their legacy! 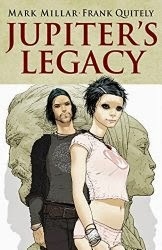 Collects Jupiter's Legacy #1-5. I really wanted to love Jupiter's Legacy because conceptually it's brilliant. Who hasn't wondered what the kids of their favorite superheroes and villains would be like? In this case they're spoiled, fame whores and drunkards without much in the line of redeeming qualities. There's a lot of set-up here and the story happens over three different time frames. But what I think pulled the story down for me was that there seemed to be no middle ground or morally ambiguous character in the entire group. Without spoiling anything I was left wondering why it came down to an all or nothing situation. I can't say I don't recommend it, the art and story are very much worth the read, I just found myself feeling pretty ambivalent about it. • 1A Output and 2800mAh battery capacity can charging more than one full extra battery life for your iPhone 6, 5s, 5c, and most other smaller smartphones and devices. 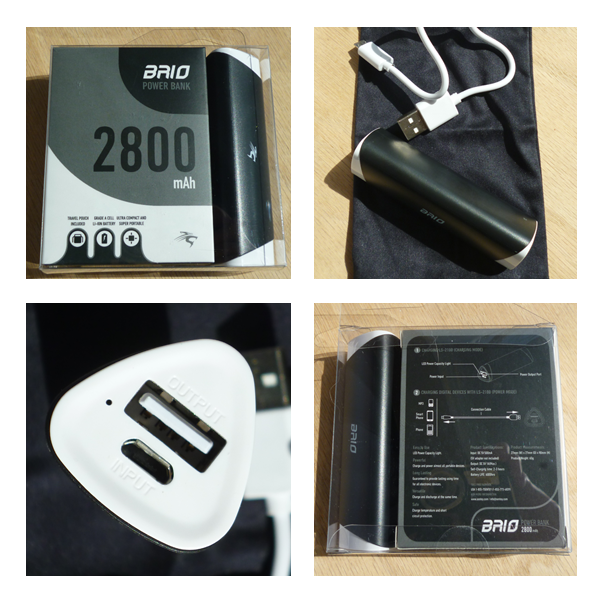 • When designing our BRIO Power Bank Series, we fully consider your safety in use. • This model involves Security Protection Design which provides: over-charging protection, over current protection, over discharge protection and short circuit protection. So how fast does it dump? I did a test with my Samsung Galaxy S4 a couple of nights ago and this was my result. I plugged the Brio into my phone at 9:55PM when it was at 63% charged and set it next to me while I read on another device. At 11:10PM my phone alerted me it was fully charged. So depending on your device I'd bet 3-4 hours for a full charge from being dead. Which makes it a very reasonable option for those situations where you've left your charger at home and wind up low on juice. Got pets? Beat the springtime shed with this handy tool! Product Details: Get a grip of your pets hair! Super effective solution for your pets shedding at an amazing price. Remove excess shedding and improve your furry freinds hygiene while keeping their coat shiny and beautiful. 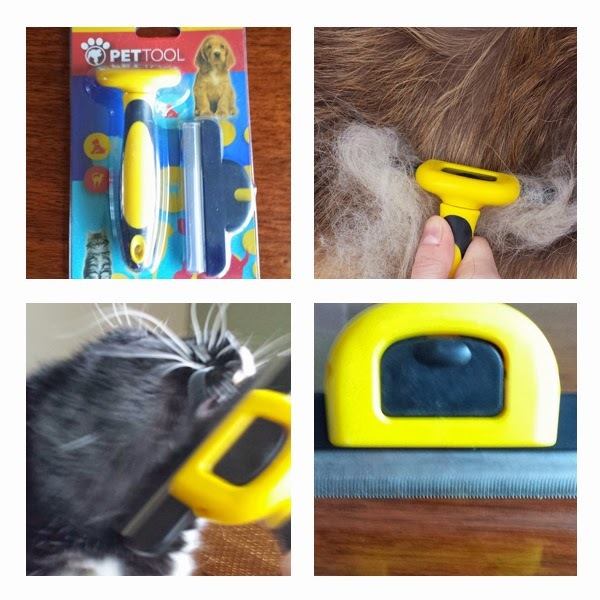 PETTOOL is a one size fits all deShedding tool designed for Small, Medium & Large- Cats & Dogs, that have Short, Medium and Long hair. Ergonomic and durable handle that wont break is a perfect tool for removing loose, dead hair, while gaining a shiny top coat in minutes. For best results, we recommend deShedding your pet immediately after washing and drying. Use only on a completely dry coat. 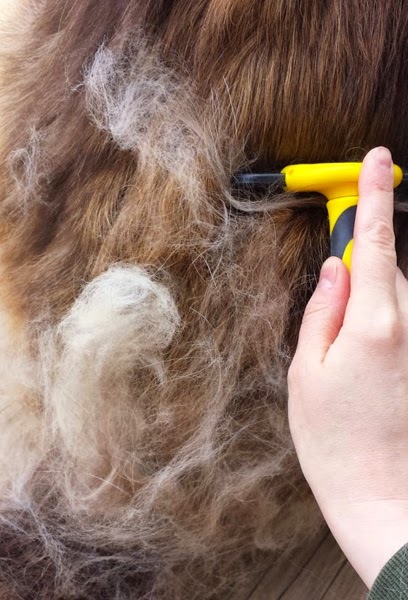 Use the deShedding tool much like a brush and gently stroke across the pet's coat in the direction of hair growth, angling the stainless steel teeth of the deShedding edge toward the coat. I've got a long-haired GSD with a crazy thick undercoat, a short haired tuxedo cat who loves to be brushed, and a Russian Blue that has the world's worst undercoat. But I'm also on a budget so buying a bunch of brushes until I find the right one is just not possible. If you're like me and don't want to buy a dozen brushes I can say that I really like this one both for its effectiveness and for the price. Seriously, it takes one heck of a brush to tackle my dog's coat and as you can see by the photo, she's a hairy beast. I took her outside and brushed her for about 10 minutes and my yard looked like we had a tribble infestation there were so many big balls of fur everywhere. Surprisingly she also tolerated it a lot more than previous attempts to tackle her undercoat with a slicker style brush. The Russian Blue cat can be a nightmare because he loves getting his belly brushed (he's weird that way) but not his back and sides where the undercoat can mat really bad. But I've been deshedding it with this comb and he's looking so much better. He's even tolerating more brushing than he usually puts up with. My tuxie—as you can see in the photo—thinks the comb is the best thing since canned tuna. Happy pets. Happy pet parent. I'd recommend it. Product Details: You're now part of an elite brotherhood of gamers whose sole purpose is to effortlessly dominate the competition! 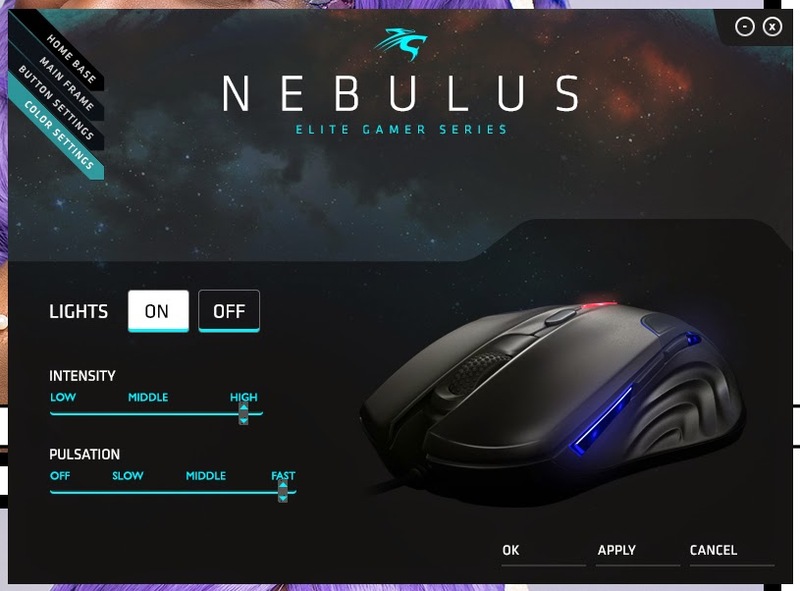 Along side your elite gaming brethren, wielding only your cunning wits, heightened senses, and your Nebulus gaming mouse from Sentey, you're about to embark on a journey to conquer every corner of the gaming universe!! Fear is not an option with Nebulus! Rest assured that it is more than properly equipped with all the features you could ever need to seize control of the gaming galaxy! 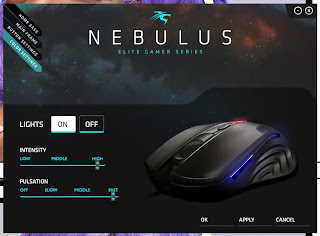 Including: 4 software configurable DPI levels (up to 3200dpi each), up to 3600FPS, 3D two-way scrolling, 9 adjustable weights, low fricton PTFE feet for quick movement on just about any surface, and fast acceleration and polling rates, all built on the Pixart chipset. I've gotta preface this review by noting that I wasn't in the market for a gaming mouse for myself, but rather, my spouse. But since I'm the reviewer in the house I gave it the first run and he'll get it now that I'm writing my review. He's primarily a gamer while I'm a mix of needs from photo editing and blogging to gaming and I think a review for those with similar needs to mine is important. For gaming I was very happy with it. The Nebulus is light—even with all 9 weights inside—and agile, glides like a dream, and I found the overall shape very comfortable. But outside of gaming I've found it a pain in my backside. You've got to be a heavy clicker, which I'm just not. Curse you delicate fingers! I've had nothing but trouble with it in Photoshop and while doing basic tasks like copying and pasting text. So for those of you who have smaller or lighter hands considering this one, you might find it's going to require adjusting the oomph behind your clicks as you get used to it. The interface and configuration on the Nebulus is nice. It has plenty of options and I was really pleased to see that the lighting in particular could be adjusted both in intensity and pulsation or turned off altogether. If you've got a seizure disorder like I do chances are a fast pulsing light in your peripheral is a no-go. Overall, this is a phenomenal mouse for gaming that won't break the bank. It's sleek design and adjustable weight are sure to be a plus if comfort is important to you. 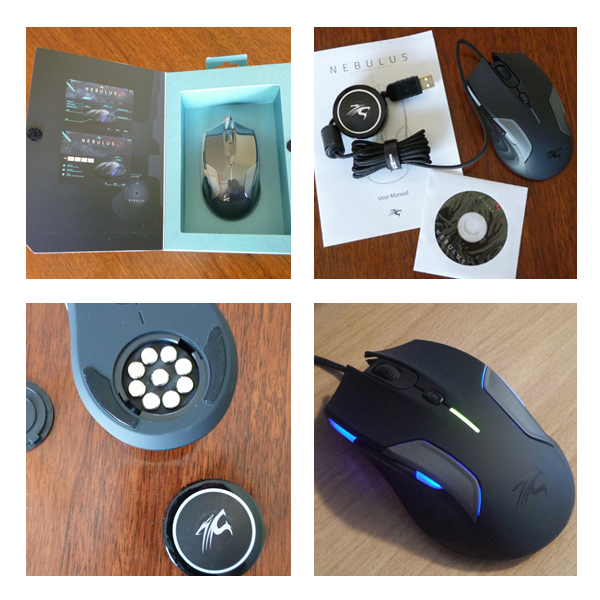 I'd recommend it for those who use their computer primarily for gaming and that are heavy handed, I honestly think this is going to be perfect for my husband and will update my review once he's had it for a couple of weeks. Instruction manual 12-month warranty and free lifetime technical support. With its FM radio functionality. Wireless Bluetooth Technology ! Do not accept old technologies, protect your investment! wireless speakers bluetooth IMPORTANT Bluetooth Functionality:. 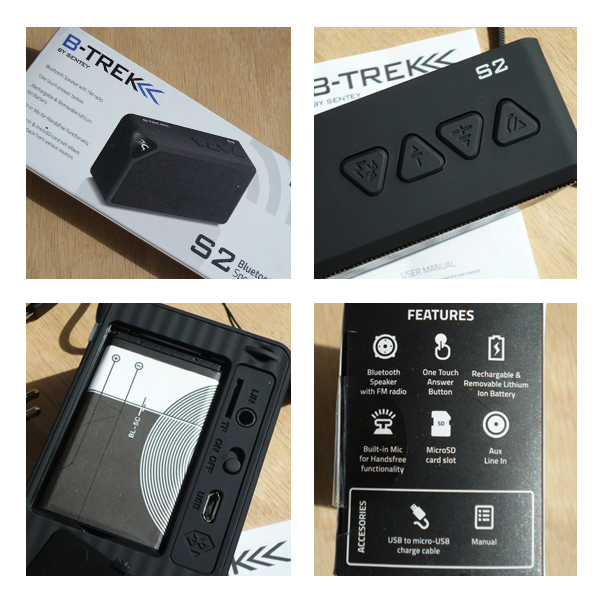 The B-Trek S2 goes into Bluetooth pairing mode automatically when turned on and there is no 3.5mm audio cable plugged in or a micro-SD card in the slot. If for some reason it does not go into Bluetooth pair mode you can hit the mode selection button to toggle through the modes until you get into the Bluetooth mode. Please review the manual for more detailed instructions and button diagram. I have an embarrassingly extensive collection of bluetooth speakers in various sizes, styles, and qualities but not one has yet been perfect for what I wanted most—a windowsill! As an avid audiobook listener I find that the devices I use them from are never suitably loud enough or have poor quality sound for what I'm trying to do. But the B-trek is the perfect size and just the right highest volume to make it a great option for my kitchen. It's not taking up a bunch of counter space while I cook or do dishes and still enjoy reading! I have had two issues with it that are worth noting though. Firstly, the lanyard that came was already broken. Since I didn't need it that's not a big deal but it's very cheaply made anyway so you might want to buy a better one if you're planning to use it. The second issue is that while I could get it to pick up FM radio stations it wouldn't stay on one and kept flipping even when it had a strong signal. Since I didn't plan on using it for radio it's a non-issue for me but it's worth knowing it might be an issue where signals aren't flawless such as in a rural area. I also haven't used the microSD or built-in mic yet as I don't have a need for those features. If you're simply looking for a bedside or small space bluetooth speaker I think the B-trek is a nice option. It has great sound quality, is light enough to tuck in a purse or backpack, and has other features you might find useful. I'm always in search of the latest cool new thing to make my life easier. Recently I found one that I can't stop raving about offline, the Hoo-rag! What is a Hoo-rag you ask? "Hoo-rags are revolutionary headwear that are worn by hundreds and thousands of male and female outdoor enthusiasts and athletes all over the world. The Hoo-rag is made of 100 percent polyester microfiber that wicks away moisture and protects you from the suns harmful rays! Rated to 30 UPF." My dad has skin cancer and with our fair skin we burn easily so sun protection is a big deal for me. The Hoo-rag has a very good UPF rating which makes it great for protecting your neck while gardening or if you shave your head in the summer like Mr. Rhi does, it'll protect your dome from getting scorched. I've been 10 months no-poo (as in, I don't use shampoo anymore) but the hardest part of it was that first month when my hair/scalp was going bonkers and absolutely hideous to manage. 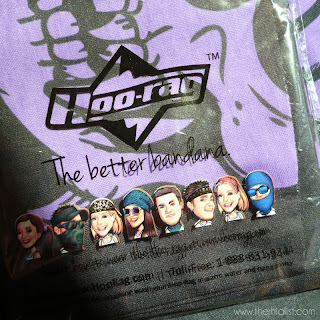 The Hoo-rag makes a fabulous beanie or headband, even a ponytail holder. Better yet... it stays put! So while you're figuring out your no-poo routine it'll make a really helpful tool in keeping your hair under wraps. Not into the shampoo-less life? It comes in loads of stylish prints and is great for active lifestyles. 4. Spring Cleaning. Or any cleaning really. If you're sensitive to even the friendliest of cleaners or dust, as most of us asthmatics are, wearing it over the nose and mouth can provide some protection. I've got seven book shelves and I hate dusting. The Hoo-rag can slip up over the face comfortably to keep some of that out. I dunno about you my dear readers but I'm pretty boring when it comes to my clothes. 9 out of 10 times you'll catch me wearing a goofy pop culture referencing tee shirt and jeans or pajama pants. Probably a hoodie too. 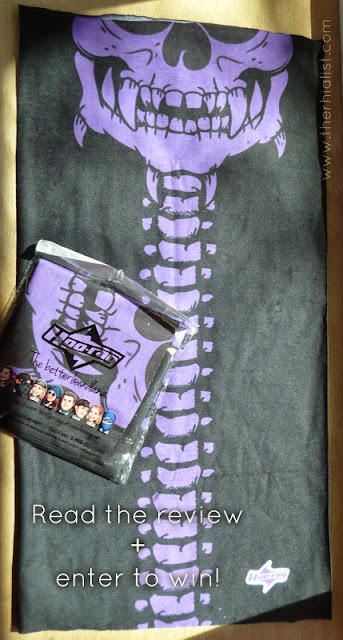 But if I'm sitting here blogging in my jeans and hoody wearing the Purple People Reaper... I'd like to think I look pretty cool. My 5-year-old thinks I look ugly in it. But then this is the same kid who said my makeup made me look like a skeleton the other day. Kids are jerks. lol For obvious reasons I'm rather partial to The Walker print but if you'd rather look pretty than scary I'm a big fan of the Electric Cheetah and Blue Persuasion. Whatcha think? Did you find a reason to add a Hoo-rag to your wardrobe? I'm hooked and I bet most folks here in Montana are going to be all over them, we're outdoorsy people 'round these parts. Enter to win a Purple People Reaper like mine, US addresses only! 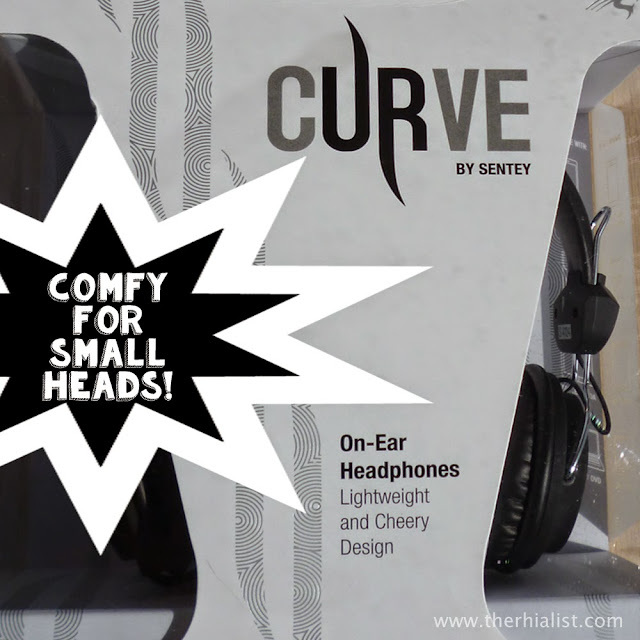 Lightweight and comfortable the Curve headset from Sentey is an excellent option for kids and people with heads on the smaller side. I really, really like them! The sound quality is excellent and they're so light I could forget I was wearing them if they were a little bit bigger. Alas, at their largest setting they just fit my head and are a tiny bit snug which means I can't put them on over a beanie or with my hair in certain styles. This does make them a great option for the folks who do run on the smaller side. One of the features I like best is the braided cord. Initially I thought I'd hate it but I find it flexible without being easy to damage. It is built-in so you can't change it out but most of us won't need that option. While it has an in-line microphone it does not have in-line volume controls which aren't a deal breaker but would have been nice. 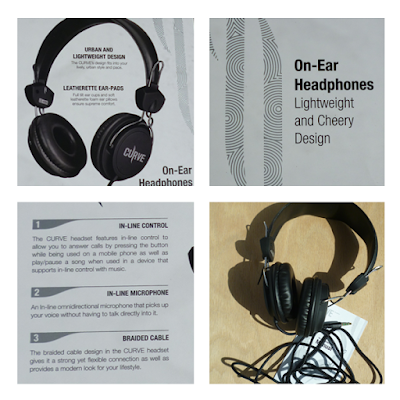 The Curve is a very comfortable, light headset perfect for casual needs and smaller heads. Is Your Car Ready for Summer Travel?